Acknowledge the positive of the past, validate that you are worthy as you are, and celebrate your victories big and small. Step to Success: A step to your success is anything that moves your life and your business forward. Whether it’s an app, a book or an idea, you can apply something today that can help you succeed. Today’s step to success is other free stock image sites that I am using other than Pixabay. Dancer’s Dialect: The Dancer’s Dialect is the dancer’s language. I share dance terminology and concepts across different genres so you can see the correlations in your life and in your business. Today’s word is fan kick. Check out this video of how to do a fan kick. Freestyle Flow: I talk about how communication is misconstrued even if you think you are being crystal clear. And, how I used to spend tons of emotional energy on overthinking conversations. 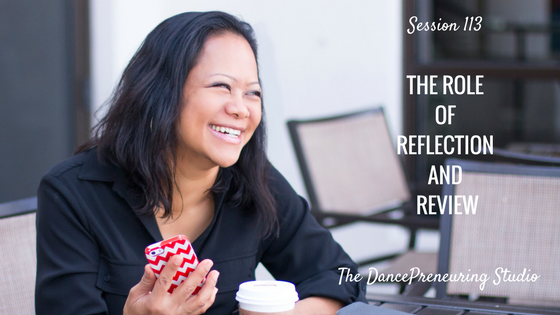 Feature Presentation: The role of reflection and review is an important one. In this session, I cover some important discoveries reflecting and reviewing past notes.